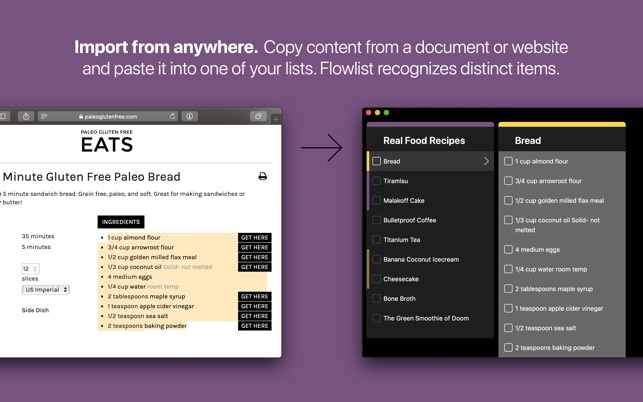 Flowlist is an elegant tool for self-management and creative writing. Unbelievably easy yet infinitely flexible. Organize your brain in flow! 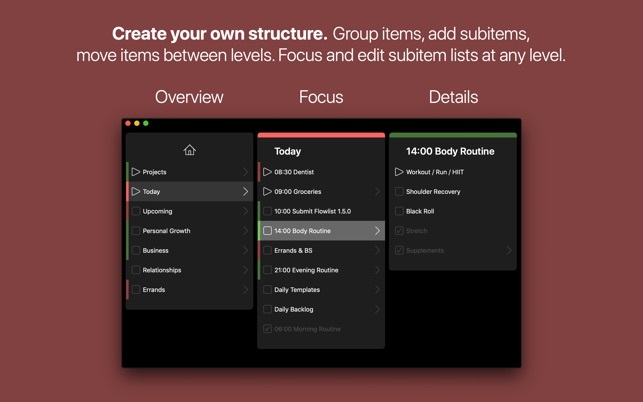 The simple concept of hierarchical lists, the fully animated beautiful interface and the consequent design for creative focus make Flowlist unique, widely applicable and incredibly fun! 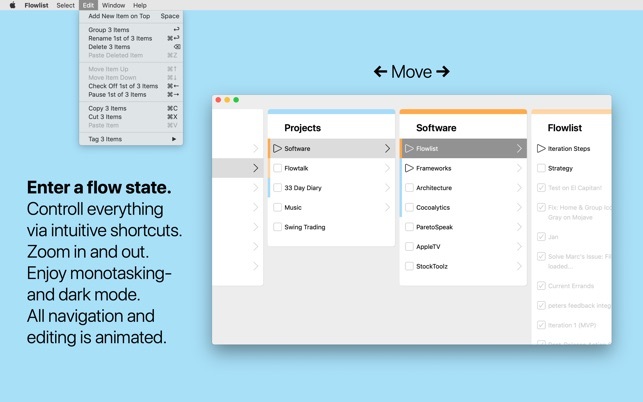 Flowlist does not force your stuff into categories like "Project" or "Subtask". Instead, items are universal and may contain other items, like folders on your Mac contain other folders. You're free to organize yourself in your own way. 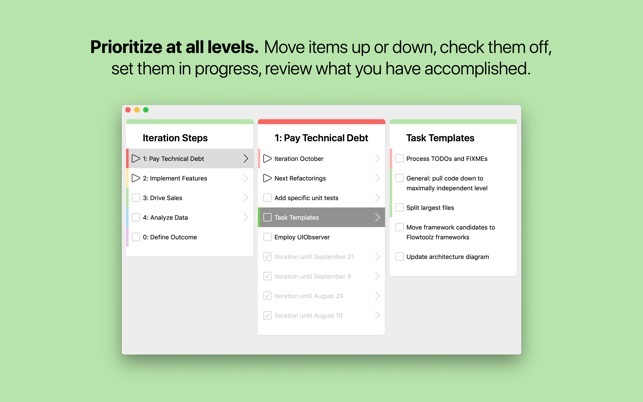 A novel interaction concept combines intuitive key commands, a radically clean interface and meaningful animations, so you can rapidly navigate and edit your item hierarchy in a state of deep concentration. 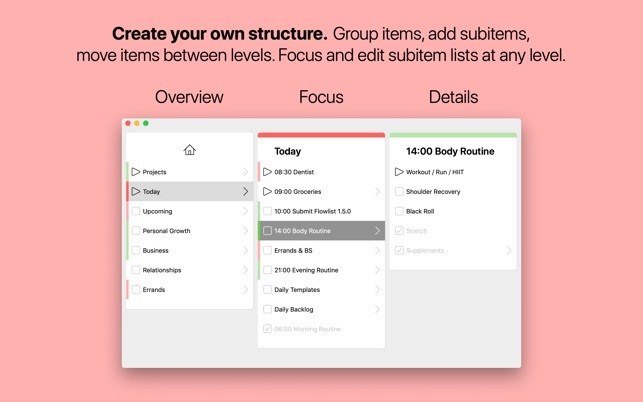 • Create your own item hierarchy: Group items together, add subitems to any (empty) item, move items between levels. 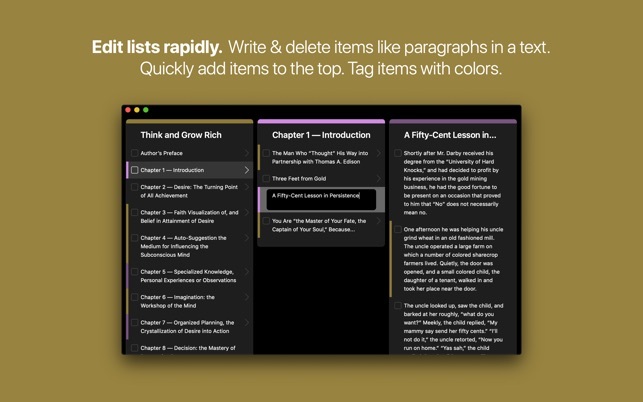 • Export any list and its item hierarchy as plain text (.txt) or markdown (.md) with paragraphs, headings, sub-headings etc. • Tag items with colors. 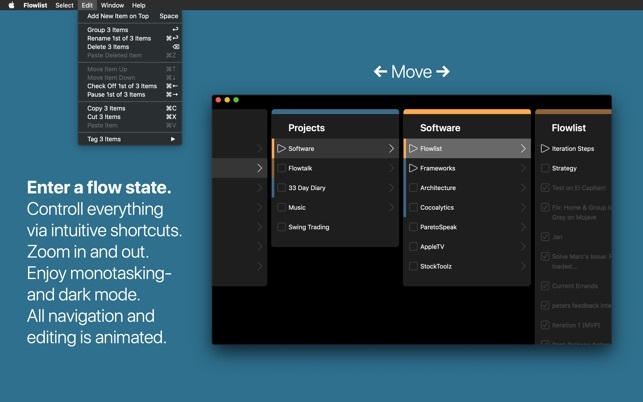 • Switch to Dark Mode to give your eyes a break, sleep better, work at night and feel like a pro. 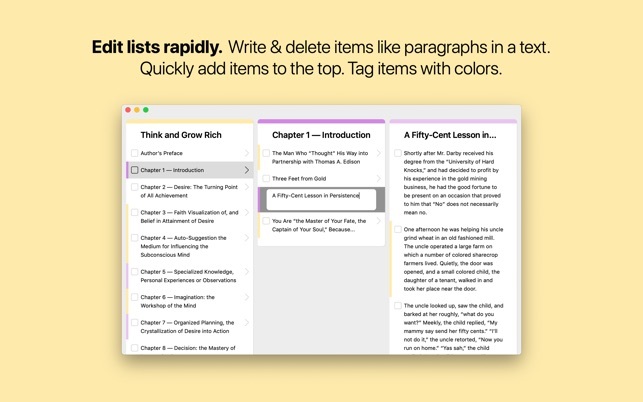 • Paste content from any document or web page. Flowlist detects distinct items. • Adjust the font size and zoom level of the interface to your screen size and way of working. • Enter monotasking mode or fullscreen. • Your hands never have to leave the keyboard and your eyes can stay focused on your content. 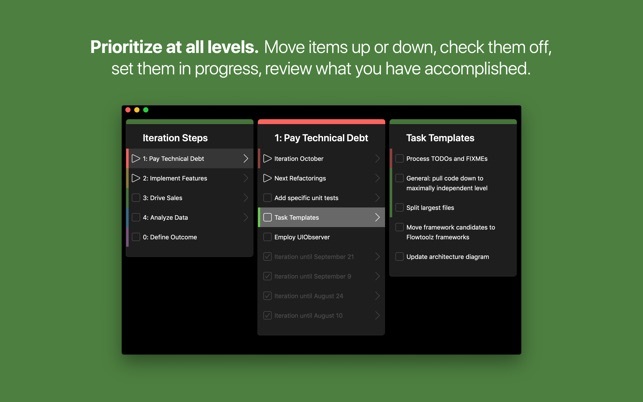 With just a few intelligently laid out key commands, you have rapid control over everything. • The interface is focused. You change focus by navigating your item hierarchy. Overview is always to the left and details are always to the right. • The interface is clean. No buttons, knobs, alerts, popups and such clutter. 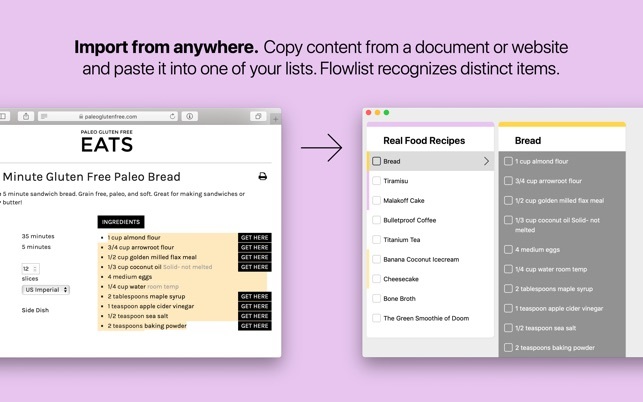 • Flowlist animates all your navigation and editing, which makes it fun to use and helps keeping track of changes. This free version has all features, saves all items and will never expire. It is only limited to 100 items, not counting groups, which will be enough in many contexts. Try it for yourself, a progress bar at the bottom tracks your item count. • Pay once, then use Flowlist forever. No subscription required. • Early bird advantage: Owners of the full version get all new features as free updates, even when the full version price rises. This update fixes a bug where items couldn't be colour-tagged via keyboard after editing their text. When I need to quickly jot down ideas, I will open Flowlist first. It looks good and doesn't get in the way. I can capture a stream of ideas in a way that I can then easily organize. Works way better for me than all of the different mind mapping apps I've tried. That said, I think the developer would help himself greatly if he did a couple of how-to-use-Flowlist videos that don't make users wish he'd taken a handful of Ritalin first. I discovered this producthunt and couldn’t be happier. I am an avid user of trello but as a developer, it lacks some of the speed I need to quickly draft and organize my thoughts for a certain task. This is a great tool paired with pomodoro!